Home » Learning BJJ Faster » How can I remember all the techniques I’m taught in BJJ? How can I remember all the techniques I’m taught in BJJ? Keep a journal. Write or type up what you learn in each class. Try to detail how the instructor taught each move, how you performed them, and any successes or failures you had with them in sparring. What’s important is the act of recalling and visualizing what you learned, not whether or not you ever reread your notes. Visualize. Whenever you have time to daydream, put your brain to work on a BJJ technique. It could be what you learned last class, or something you’re trying to remember from a year ago. You can do this while laying in bed as you drift off to sleep, standing in the shower, sitting on the toilet, walking the dog–whenever you’ve got brainpower to spare. Draw a flow chart. BJJ can seem like a disorganized mess of techniques. What you’re taught in class doesn’t always follow a logical progression. Map out each position you know to show how they connect to each other and what moves you know from each position. Drill, drill, drill. Nothing beats plain old drilling! The reason you’re trying to remember these techniques is so you can do them, so just do them! Instead of awkwardly making small talk and pretending to stretch in the time before class starts, grab a training partner and put in reps. 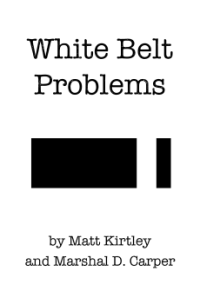 IMPORTANT NOTE: By submitting an answer, you give permission for it to be published in future editions of the White Belt Problems book. private lessons when your a newbie worth it or not? Is it good practice for a beginner to be at open mats? Is it ok to wear shirts and gear of other people/academies that im a fan of? Is an open level gym bad? dogs_bolx on Is it good practice for a beginner to be at open mats? LittleAussieGrappler on Does Gi color matter? LittleAussieGrappler on What makes a martial art effective? LittleAussieGrappler on private lessons when your a newbie worth it or not? LittleAussieGrappler on Does BJJ prepare you for self defense?